Khyentse Norbu, aka Dzongsar Jamyang Khyentse Rinpoche, is a distinguished Himalayan Buddhist Lama  and a unique cultural figure, because he expresses himself to a wide public audience through both his writings and his filmmaking [2,3]. A native of Bhutan, Norbu is that country’s only feature filmmaker. He got his first closeup exposure to feature filmmaking when he served as a consultant for Bernardo Bertolucci’s Little Buddha (1993), and he first came to prominence on his own when he wrote and directed Bhutan’s first feature film, The Cup (Phörpa, 1999), an award-winning story about soccer-obsessed novice Tibetan monks in northern India. 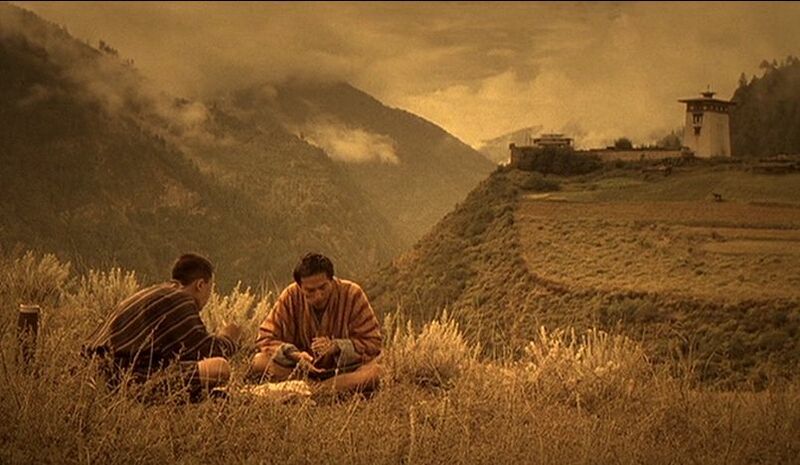 Norbu’s second film, Travellers and Magicians (2003), was even more impressive. 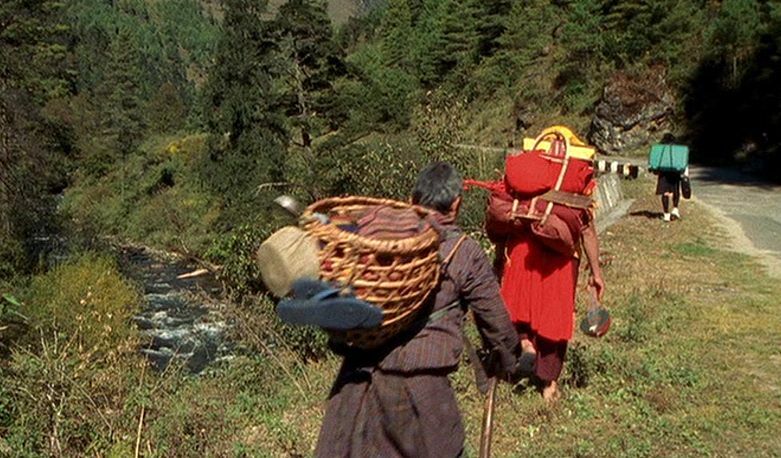 This film, which like The Cup featured a local cast with no professional acting experience, was the first feature to be shot and produced entirely in Bhutan, and yet its production values stand up to the highest professional standards . 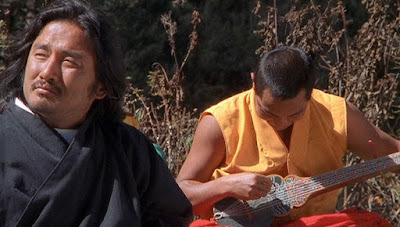 Travellers and Magicians consists of two parallel narratives, one of which (the Tashi story) is told as an inner story by one of the characters of the outer story (the Dondup story). 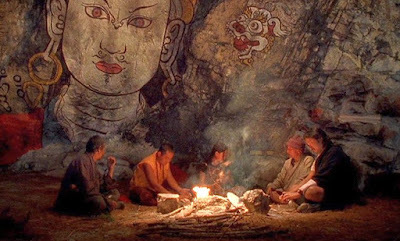 And indeed it seems that storytelling, particularly the stories that we tell about ourselves to ourselves, is a key theme of this film and one that is presumably connected with Buddhist insights. The outer story starts with Dondup (played by Tshewang Dendup), a young government official who wants to leave the small village of Khumbar to which he has only recently been assigned and travel to the America of his fantasies. From the outset we can see that the long-haired and well-fed young man is self-obsessed and dreams of a disco world full of scantily-clad young beauties. Life in his small Bhutanese village is just too slow and boring for him to endure. When he gets a letter from a friend informing him that an American visa can be arranged for him if he can get to the capital city of Thimphu in a few days, he dons his trendy basketball shoes and “I [Heart] NY” tee-shirt and rushes off to catch the long-distance bus that makes trips to the city. However, various delays slow him up and cause him to miss the bus, so he is forced to try and get there by hitchhiking. a sociable Buddhist monk (The Monk, played by Sonam Kinga). They all trudge along the road together, but Dondup doesn’t want to cooperate with his fellow travellers. 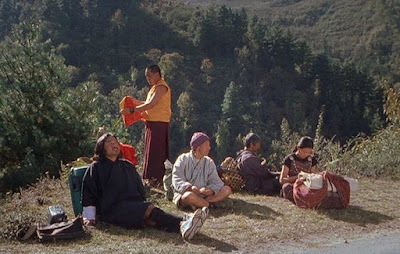 After not finding a ride all day, evening falls, and they stop to eat food that The Monk prepares from his pack. 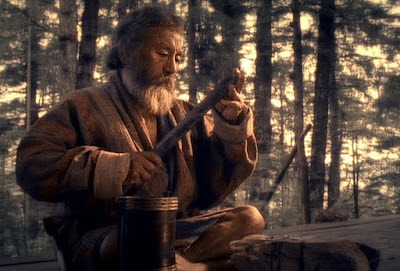 Then to while away the time, The Monk begins relating to his new friends the Tashi story. These imaginary inner-narratives are often just bundles of similarly-typed narrative fragments that are usually only implicitly present in the stories we are told, but they are more significant here in Travellers and Magicians. 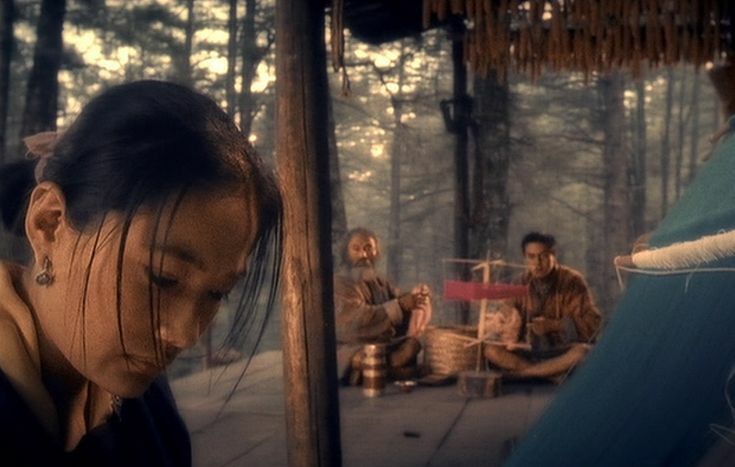 The Tashi story in this film is special, because it is an example of film noir – indeed it has characteristics reminiscent of the classic film noir The Postman Always Ring Twice (1946). A notable feature of films noir is that the imaginary inner-narratives of some of the main characters are often dark and occluded – these characters have unknown pasts and obscure futures that are dimly disturbing. This particular contrast in the inner-narratives of the two main stories – the Dondup story and the Tashi story – is a major feature of Travellers and Magicians. 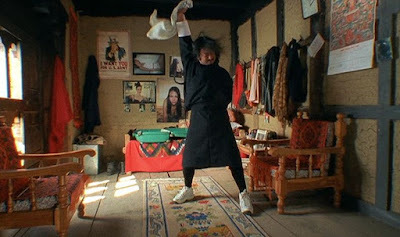 In the Tashi story, Tashi (Lhakpa Dorji) is a young man studying under a master to become a magician, but he is a lazy student who, like Dondup, just dreams of babes and entertainment. His younger teenage brother Karma, though not permitted to study magic, is more ambitious and secretly tries to spy on the master magician’s lessons. One day while out in the fields with his brother, Karma gives Tashi some chhang (a Bhutanese home-brewed alcoholic drink) spiked with his own hand-picked “magical” concoctions. After taking the drink, Tashi looks up to see a saddled horse that his family has apparently just acquired. As soon as he mounts the horse, it takes off on a wild uncontrolled gallop, carrying Tashi deep into the forest. Eventually the horse throws Tashi off, leaving him lost in an unknown wilderness. Then it starts to rain violently. Lost and desperate for shelter, Tashi stumbles upon a cabin deep in the forest that is inhabited by a reticent old woodcutter, Agay (Gomchen Penjore), who reluctantly allows Tashi to come in out of the downpour. The telling of the Tashi story was interrupted by Dondup’s falling asleep. The next morning the three hitchhikers continue their efforts along the picturesque mountainous east-west road, with Dondup continuing to be uncooperative. 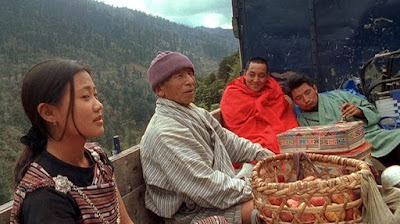 They eventually hitch a ride on the back of a flatbed truck, and they are soon joined by an elderly rice paper seller from Khumbar and his comely teenage daughter Sonam (Sonam Lhamo). 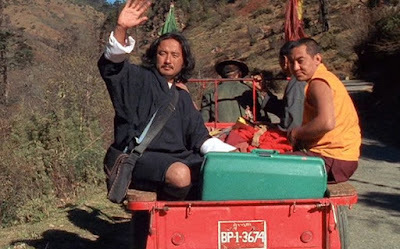 After awhile the truck breaks down, and while the driver attends to making the repairs, the hitchhikers get out and The Monk resumes with his story. After sleeping the night in Agay’s house, Tashi wakes up to discover that the elderly Agay has a sensuous young wife, Deki (Deki Yangzom). He also learns that the dour hermit Agay is physically abusive towards his woman. Since Tashi is still lost, Agay goes out with him and guides him part of the way to the next village, and then the hermit returns alone to his home. Sonam's Father: “So, is it really true you're not coming back to the village?" Although they speak dreamily of the presumed beauty of America, the viewer of this film can see the evident natural beauty of Bhutan that is all around them. Then The Monk resumes his story. Tashi can’t find his way alone in the heavily forested wilderness and eventually wanders by chance back to Agay’s house in the forest, where he is allowed to stay until Agay can make his next trip to the village. There is a marvelously filmed sequence here showing Deki giving a bath to Agay in their outdoor hot-water tub while Tashi looks on in fascination. He is clearly becoming entranced by Deki’s naturally sensual demeanor. Then after Agay drinks some chhang and falls asleep in the house, Tashi sneaks out to covertly watch Deki bathing alone in the tub. Continuing on the road, the travellers are still seeking a ride, and Dondup happens to see a car rush past them that we see being driven by a middle-class woman looking like Deki from the Tashi story we have been watching. But despite Dondup’s avowed claims to be pursuing his dreamland quest, it is evident that he is taking a growing interest in the modest young country girl Sonam. In a private conversation he asks her about her goals, and she reveals to him that although she has the grades to get into college, she feels it is her duty to stay in Khumbar and look after her elderly, widowed father. She also urges Dondup, like The Monk had earlier urged, to give up smoking. While Dondup had ignored The Monk’s earlier preachy recommendation, this time he does give up smoking when Sonam asks him to. When nightfall comes, the weary travellers stop and The Monk resumes his story. Tashi has now stayed on in Agay’s forest home for many weeks, and he and Deki have secretly become lovers. When Deki discovers that she is pregnant by him, she tells Tashi that they must murder Agay and run away. So Tashi prepares a poisonous mixture of herbs that he had learned from his magician apprenticeship and mixes it into Agay’s chhang. Now more involved with his local social surroundings, Dondup is becoming more cooperative and helpful, especially in connection with anything specifically having to do with the demure Sonam. Seeing this the ever-observant Monk teasingly suggests to Dondup that perhaps his dreamland isn’t so far away, after all. When a bus stops for them with only one available seat, the others, knowing Dondup’s urgent need to get to Thimphu, offer the seat to him to take it. But the now more considerate Dondup selflessly defers to the apple seller to take it. Agay is in his death throes from the poison Tashi had prepared for him, and Tashi runs away in terror at what he had done, with Deki desperately pursuing him. After crossing over a dangerous stream, he hears Deki’s screams behind him and returns to learn that the girl has fallen into the stream and drowned. Then Tashi wakes up from his nightmare, and we see that he had been dreaming everything after drinking Karma’s magic potion. So ends the Tashi story. “and so he forgot about going to America . . . ”. The entire presentation of Travellers and Magicians is beautifully executed, with excellent use of a constant stream of meaningful closeups that convey soulful ruminations and feeling. It is not easy to create a naturally and intuitively progressing visual narrative when using so many (potentially distracting) closeups, and credit must be given to the outstanding cinematography of Alan Kozlowski and the smooth editing by John Scott and Lisa-Anne Morris that makes the embedded narrative flow mellifluously. Also effective is the haunting indigenous background music that casts an atmospheric spell over all that is portrayed. What the film Travellers and Magicians reflects on is something profound about life and the way narrative construction guides our way through it. I often hear Buddhist practitioners proclaim that we should meditate by ceasing to think. Turn off your mind and enter into a samadhi of thoughtlessness they insist. But I think the situation is not that simple – I don’t believe that one should simply suppress his or her consciousness. We are constantly fabricating little mini-narratives as we make our way through life, and these mini-narratives are frequently collected into little bundles, as was the case with Dondup. But these mini-narrative bundles can fixate our attention and blind us to the richness of life that is going on all around us. The world is constantly presenting us with beautiful opportunities for heartfelt engagement, and we need to be open and alive to these temporarily available (like the peach blossom) beautiful opportunities. Dondup gradually found himself more engaged with his local surroundings right in front of him, particularly in connection with the innocent Sonam, and he gradually let loose of his narrative-bundle fixations. I do believe that mindful meditation is one of the practices that can help release us from these fixations. In fact it may possibly be the case that mindful meditation, like pure love, can help us let go of the conscious world of essences and facilitate our conscious awareness of our existential agency. For more discussion on the distinctions between essentialism and existentialism, see my essay, “Phenomenology and Red Desert” . To be sure, the Tashi story was clearly a fabricated story of destruction, a story about passion taking over one’s life and driving oneself to desperate actions. And in that inner Tashi dream, Tashi lost himself and succumbed to his desperate passions. In the Dondup story, though, we see something different – a man who is on the way to finding his authentic self by letting go of his obsessions and looking around for the constantly emerging new opportunities that can engage his true soul (i.e. the essential, often overlooked, loving godliness inside each of us). Khyentse Norbu conveys these ideas effectively in this film and, to me, offers an uplifting image for a meaningful spiritual message. He has been recognized as the third incarnation of the founder of Khyentse lineage of Tibetan Buddhism . “Dzongsar Jamyang Khyentse Rinpoche”, Wikipedia, (9 March 2018). Publications, Siddharta’s Intent, (accessed 17 May 2018). Dave Kehrjan, “Nothing Like a Pretty Girl to Energize the Quiet Life”, The New York Times, (28 January 2005).